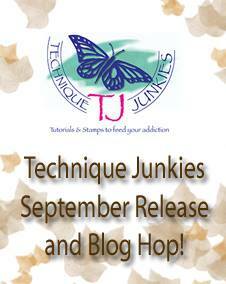 Today is November 1st, and it is the last stamp release of the year for Technique Junkies. Today I am proud to show you the new stamps we are releasing. and happy to offer you a 20% discount off the new stamps through November 8th. Simply add any of them to your shopping cart and the 20% discount will be applied automatically. 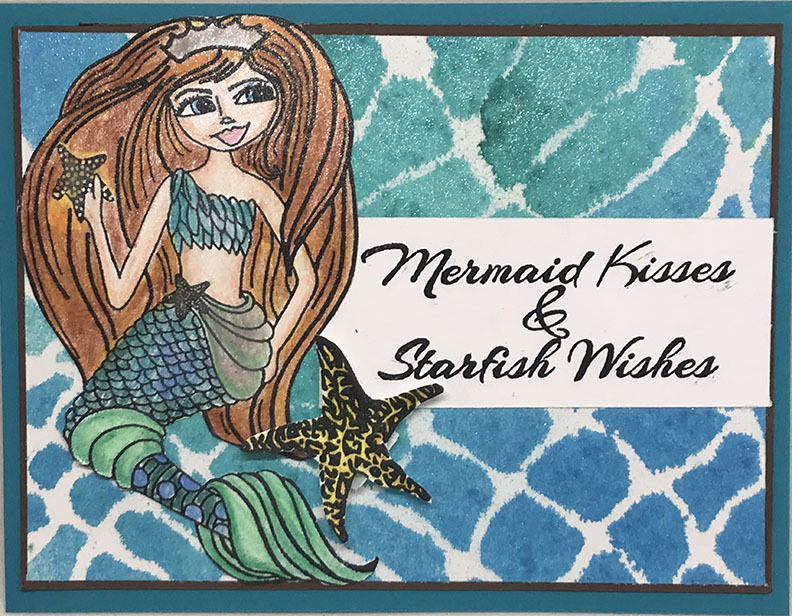 Instead of a traditional blog hop, the TJ Design Team and a few of our friends have joined together to participate in the celebration. 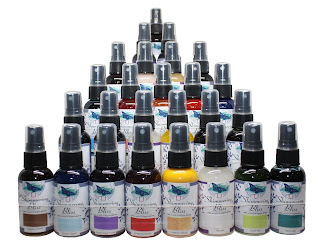 You can find the full list below, or on the Technique Junkies Design Team Blog. I encourage you to visit the blogs -- there are many gorgeous pieces of artwork within! Before I post the list, here are a few things I made from the new stamps. First, nothing is more appropriate for a celebration than Champagne! 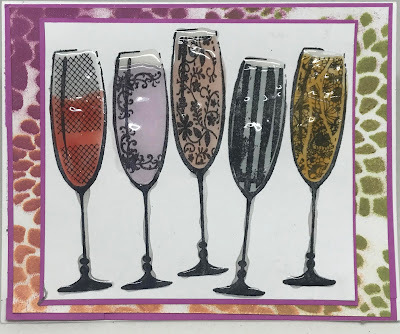 I am very pleased with this new stamp called Champagne Toast. I filled in the glasses with Nuvo Jewel Drops and Nuvo Glaze (both will be added to my store soon). 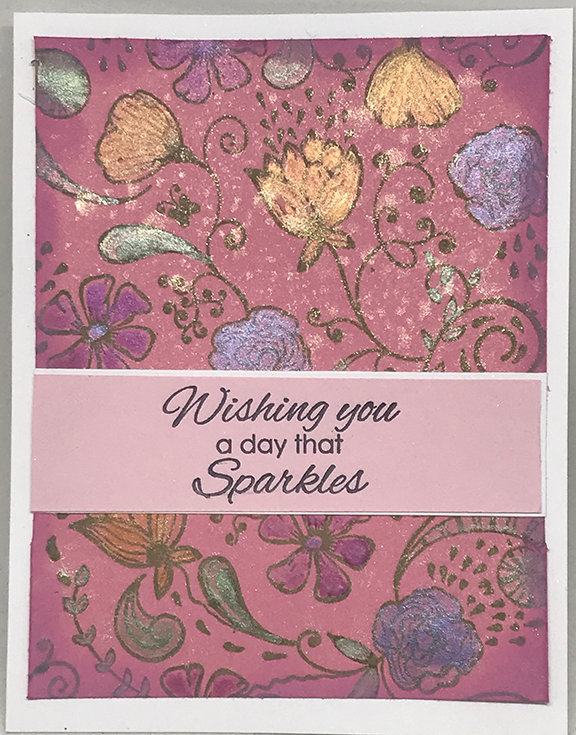 The background is the Showy Blooms Stencil that was sprayed with Thulian Pink, Golden Olivine, and Just Squeezed Shimmering Bliss Sprays. 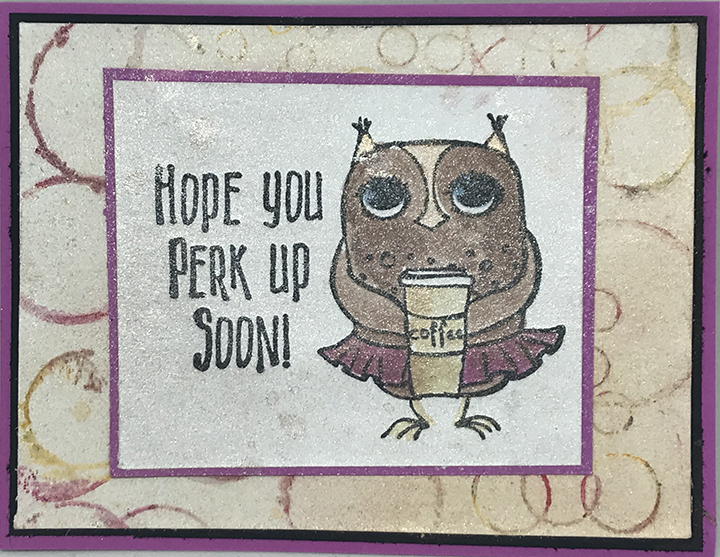 This card just makes me happy! 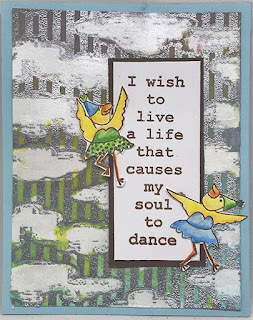 Again, the background uses two stencils topped with Shimmering Bliss. 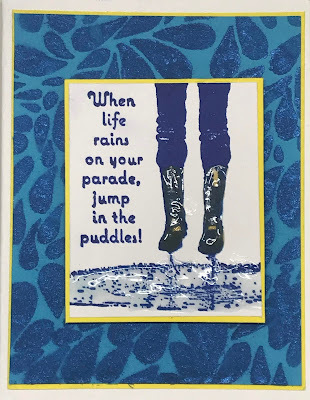 I paired the stamp with the Flowing Drops Stencil sprayed with the Lapis Lazuli Shimmering Bliss. It is so shimmery in person! 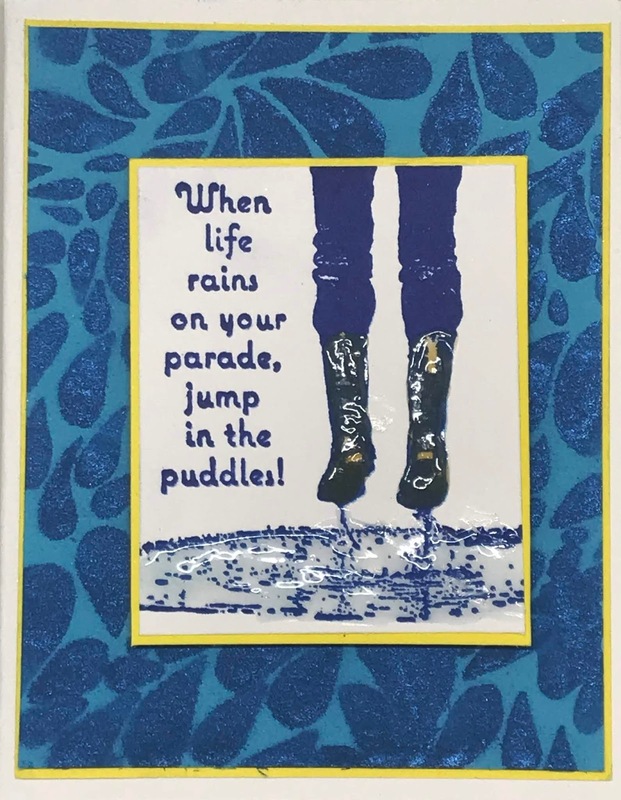 The rain boots and the puddle were goth glossed with Nuvo Jewel Drops. 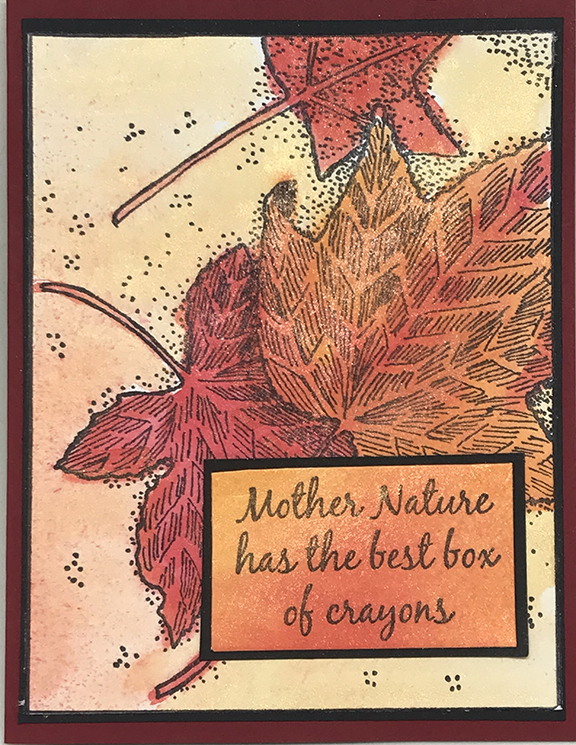 To create the colorful background, I applied Distress Oxide Inks to the Palette Knife stamp and stamped it, then reinked the stamps and turn the paper 180 degrees and stamped again. 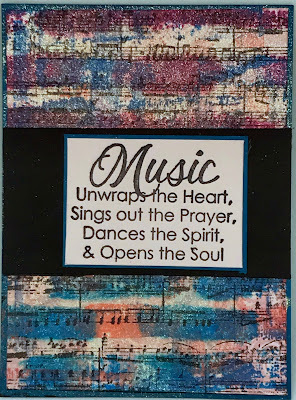 I then stamped the (previously released) Vintage Music Palettini Stamp with black to highlight the music theme. I hope you enjoy all of the artwork today. 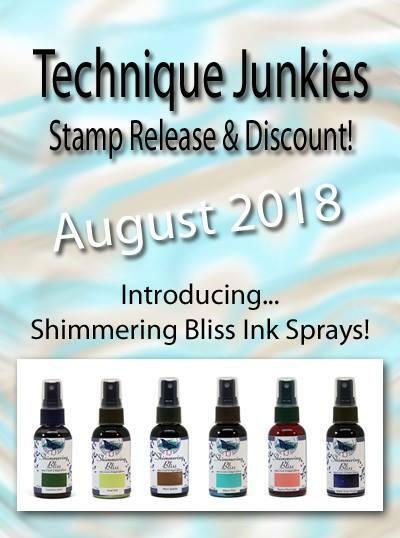 Make sure you get back to the Technique Junkies store to order the new stamps with the 20% discount, too! October New Release and Blog Hop! 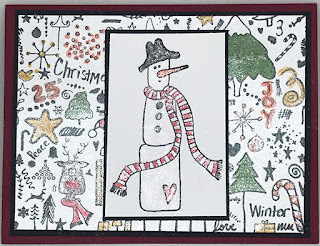 Today is October 1st and I am thrilled to announce our annual holiday stamp release! 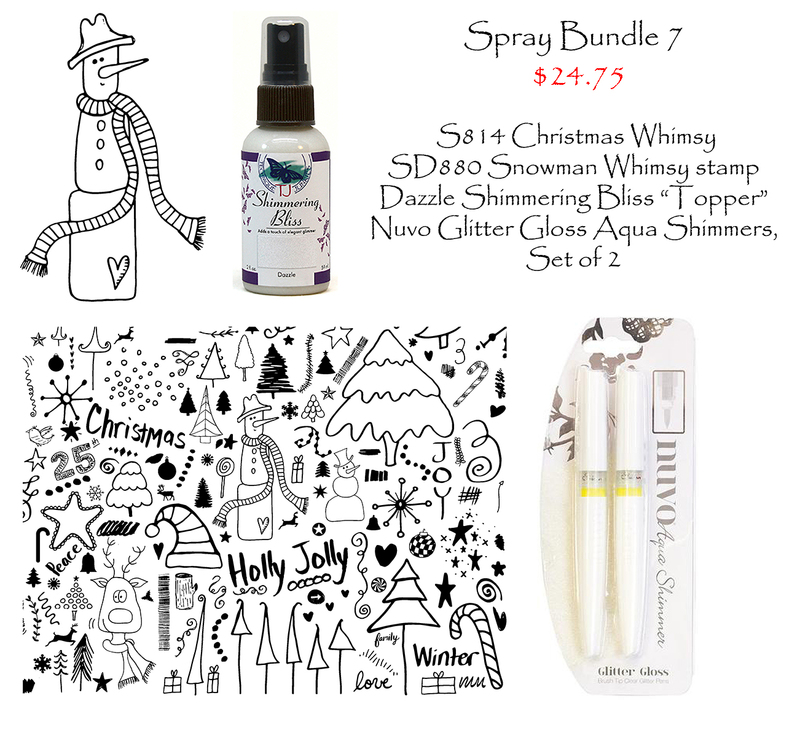 Today we have 17 new stamps and 2 new Spray and Stamp Bundles for you. I am so thrilled with the images we are showing today, and I hope you will love them as much as I do. If you came here from Lynda's Blog, you are in the right place. If my blog is your first stop, I encourage you to go back to the beginning to the Design Team Blog - I think you will love all the inspiration our fabulous team has in store for you! 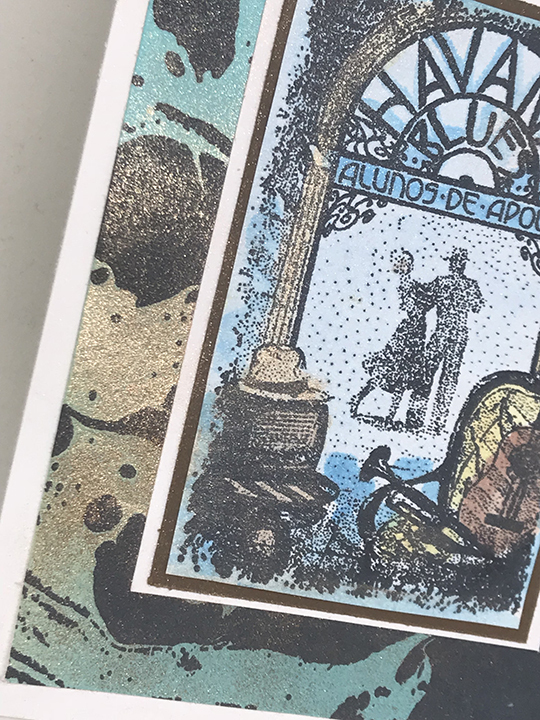 The new release includes 6 new stamps from Jan Tinklenberg from #MittenStateStamps that you will absolutely adore! Ready to get right to it? I hope you have enjoyed the hop today. Make sure to get the 15% discount on the rest of the stamps, too, from now through October 8th. Have fun shopping! Incredibly, it is September 1st already and the summer has flown by. The good news is that we have new stamps to celebrate the fall! Today we are celebrating the release of a bunch of new images, along with some Stamp and Spray bundles too. I am the last stop on the Technique Junkies Design Team blog hop, so if this is your first stop, please take a moment to go back to the beginning of the hop to the Design Team Blog and start over -- the artwork is spooky, fun, and inspiring this month! As usual, you will receive 15% off on all of the new September 2018 Stamp Releases from today, September 1st, through September 8th. Just add what you like to your cart, and they will be reduced automatically at checkout. 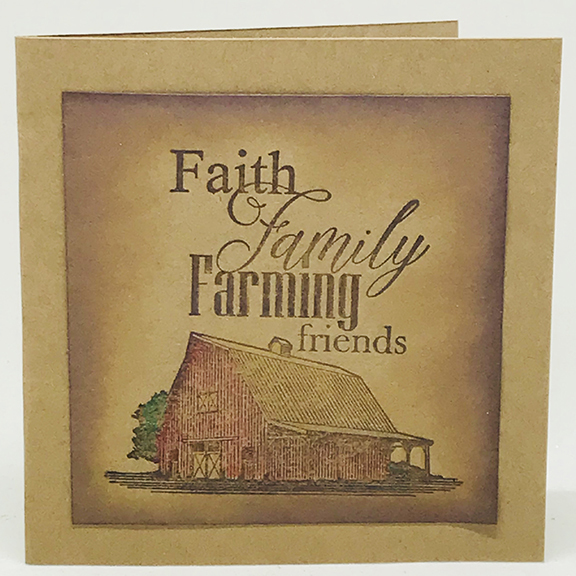 We have two new Stamp and Spray Bundles, with videos, for you, too. Go take a look! 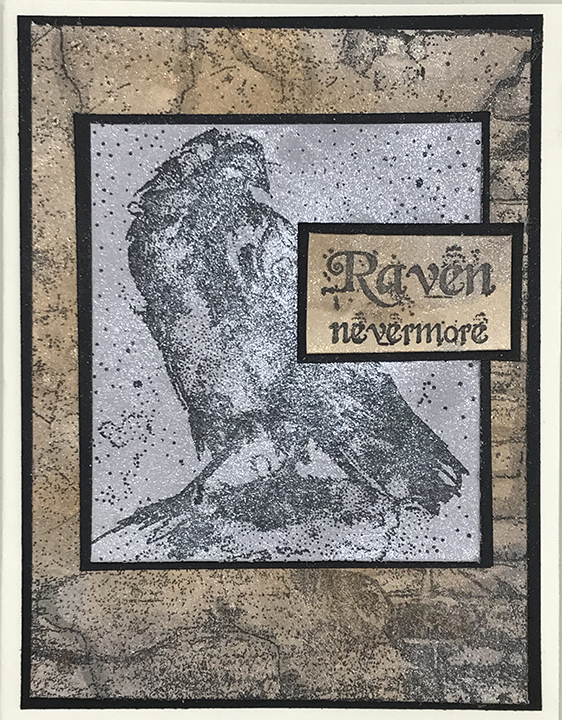 First, the Raven Collage Stamp. I love this background. It is eerie and vaguely romantic all at the same time! 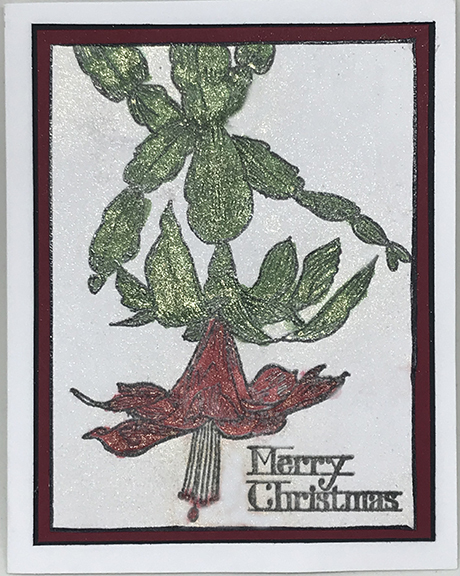 I stamped the image with StazOn ink on watercolor paper, then painted it with Dragons Blood and Harvest Sunset Shimmering Bliss Sprays. 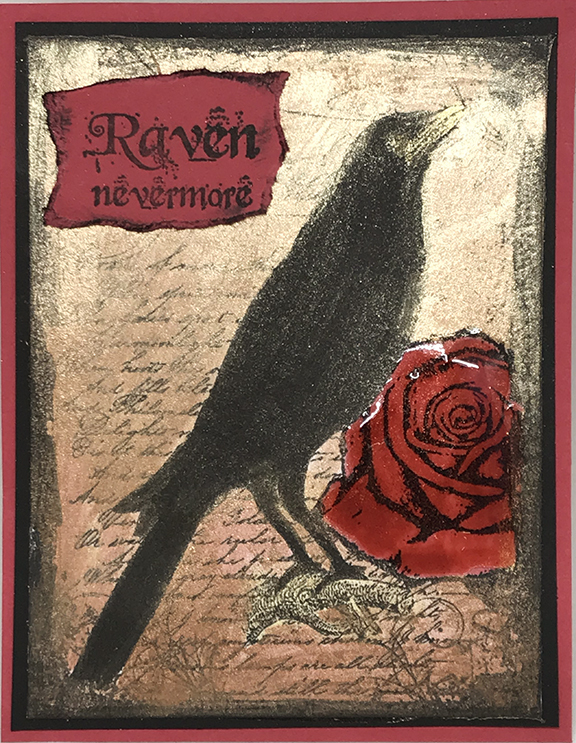 I then went back over the raven with a black marker, and highlighted the rose using Diamond Glaze (like Crystal Effects, or Glossy Glaze). 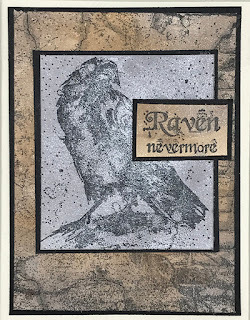 I thought the Raven Nevermore stamp was a perfect complement to my Raven card! 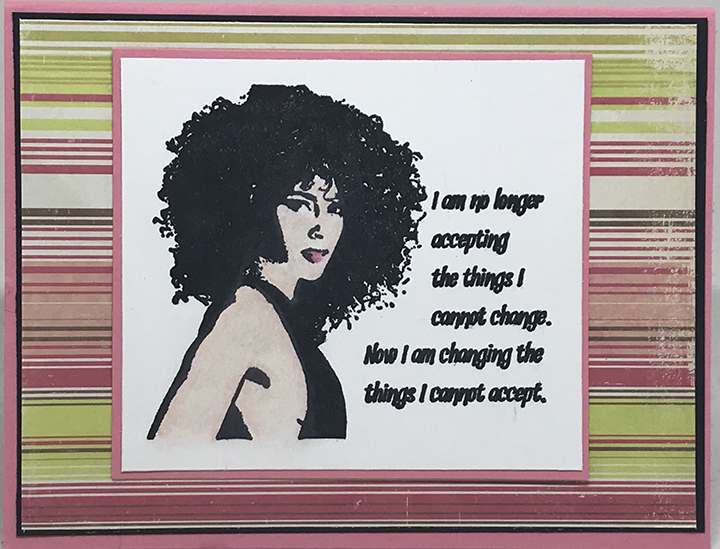 (note that the paper I used for the sentiment and background is RED, not pink. For some reason it came out funny with the camera and I was making a mess while adjusting it with Photoshop, so I just left it). 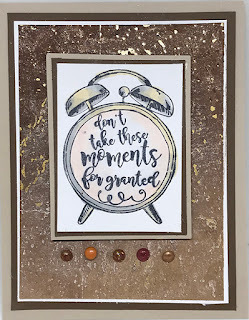 Next up I have the Moments stamp. 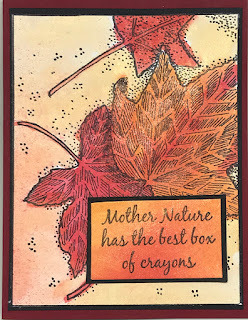 The background of this is the Cork Paper from the Spray and Play Paper Pack (it will be back in stock soon, really!). 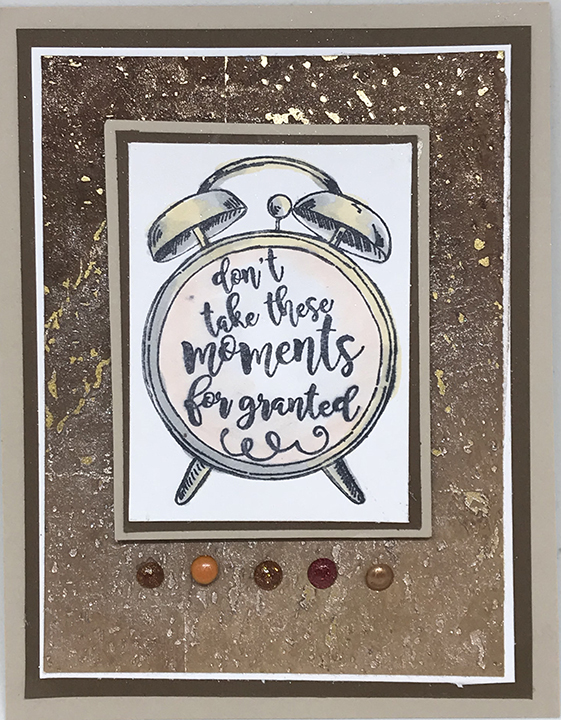 The background was sprayed with Worn Saddle and Chestnut Mare Shimmering Bliss and is just G O R G E O U S. The Moments stamp was colored with Copic Markers to highlight the vintage alarm clock. Love this simple creation! It was a blast coloring the Autumn Doodles Background! I intended the palette to be very Autumnal, but somehow I introduced the blues and I think the result is so much fun! 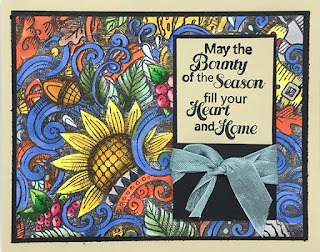 The sentiment is from the Thanksgiving Blessings stamp set (previously released). This card uses the Ephemeral Crow, Raven Nevermore and Old Wall Background along with the Smoldering Ash and Worn Saddle Shimmering Bliss Sprays. 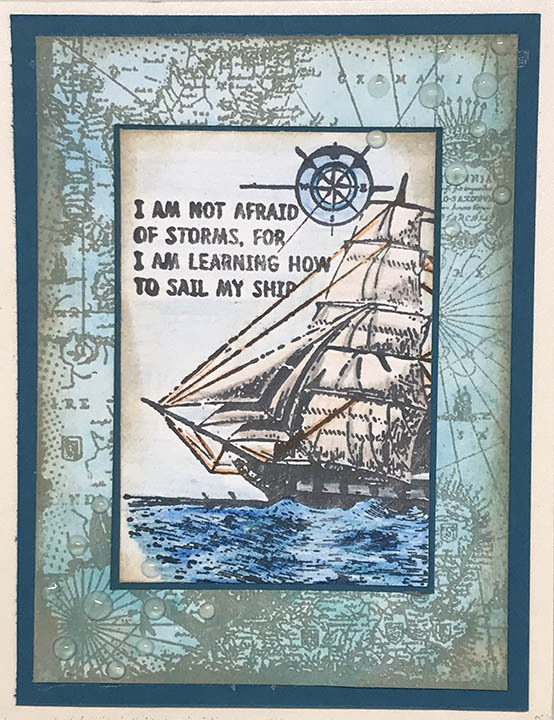 This is actually the card from Bundle 4 of the new Stamp and Spray Bundle release for September. Thank you for stopping by today! I hope you have enjoyed the hop and love these new stamps as much as I do! 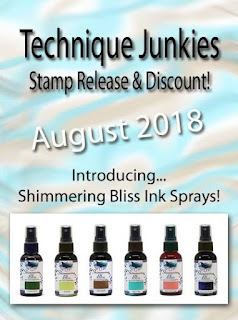 August 2018 New Release - Stamps and Sprays! Today is a super-exciting day for me! 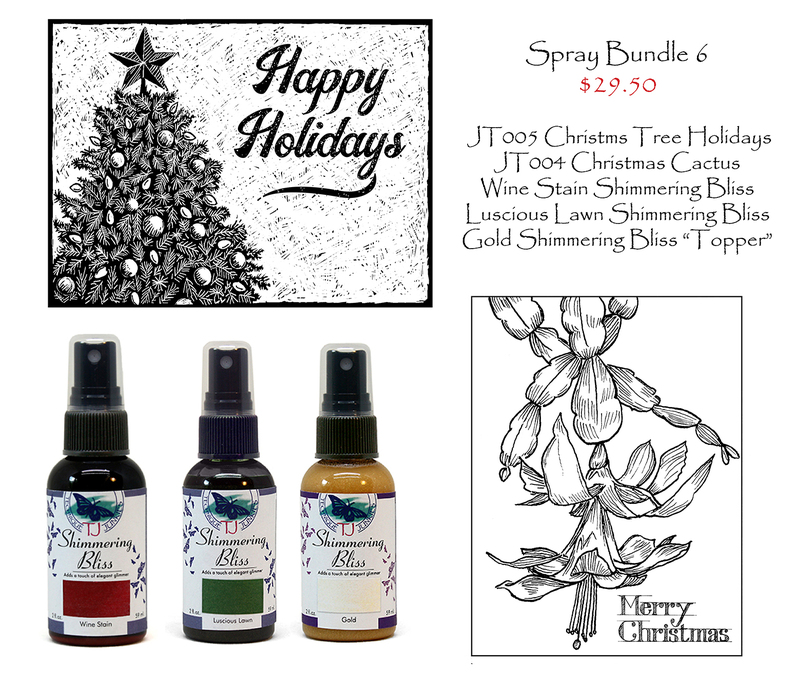 Not only is it the 1st of the month - meaning we have an outstanding release and a fun Blog Hop to celebrate, but today we are also launching our new Shimmering Bliss Sprays! If you arrived here from Lynda's Blog, you are in the right place. 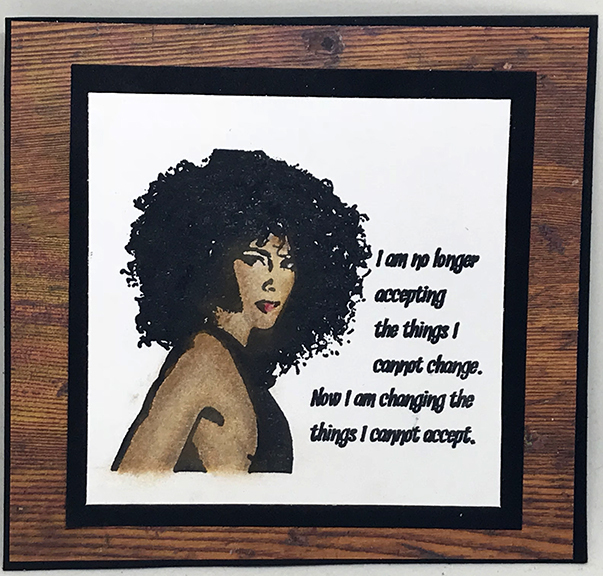 If not, I encourage you to go back to the beginning of the hop and follow along to see what the TJ team made with the stamps and sprays! My piece uses the Blues Dancing stamp for the focal image, combined with the Messy Marble background stamp, using the sprays from the Bundle in the background. I hope the hop inspired you today, and that you love the stamps and the sprays as much as I do! 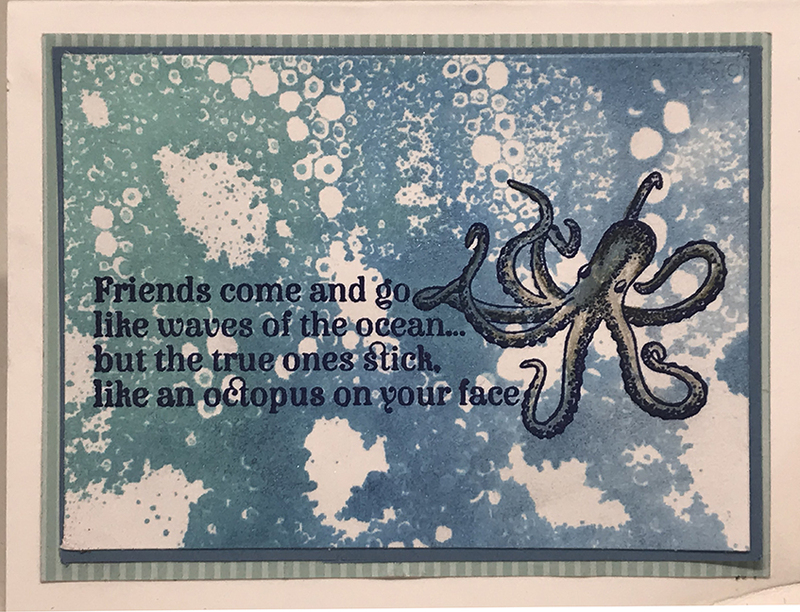 Today is July 1st, and we at Technique Junkies are thrill to have our monthly blog hop to roll out the newest stamps in the store! 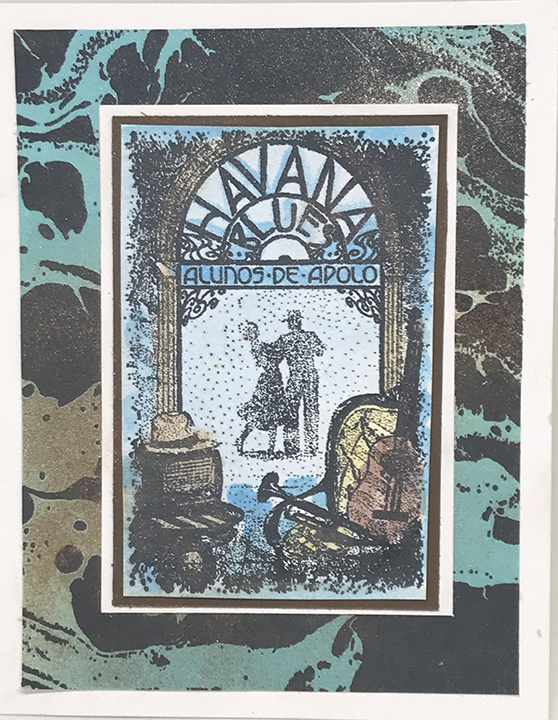 We have a great selection of stamps this month for you, most with a sea or beach theme, and some with a definite attitude. If you arrived here from Lynda's Blog, you are in the right place! If this is your first stop, go back to the Design Team Blog and start there -- we have a ton of inspiration for you today. As usual, all of the stamps in the July New Release Category are 15% off, too. Just add them to your shopping cart and your discount will be applied at checkout. Ready for more inspiration? First up is pure attitude. I paired the Attitude Giraffe stamp with a couple of sentiments from the Inside Out Patience set. 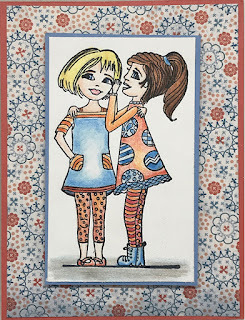 I love the inside out stamps - they are fun on the outside and snarky on the inside. So much fun! Speaking of snark....the Octopus Face stamp is full of it. I stamped it over the previously-released Sudsy Stuff stamp. 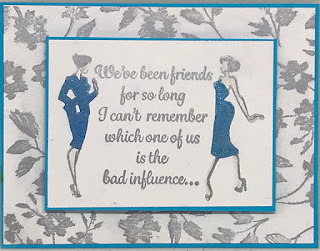 Which friends of yours would YOU send this too? On a more serious note...I used the Kisses the Shoreline sentiment with the Swirly Waves background for this beauty. 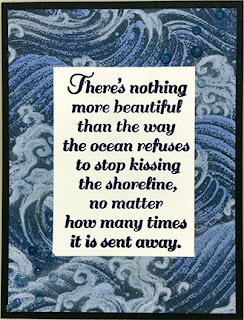 I think it is such a lovely sentiment for encouragement, don't you? 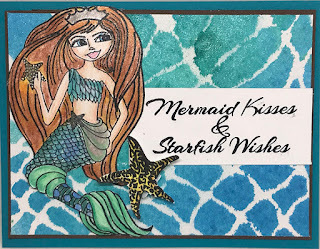 Finally, I used the Princess Mermaid stamp for this card, pairing it with the previously-released Mermaid Kisses set. 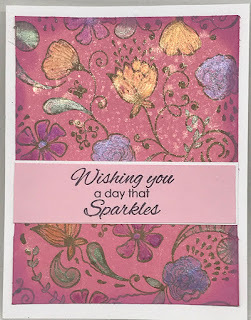 It also worked perfectly over a Shimmering Bliss sprayed Wavy Weave Stencil. Thanks for stopping by today. Your next stop on the hop is the fabulous Betz Golden. You don't want to miss her work! 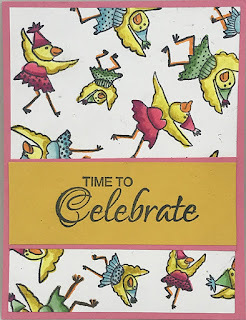 Today is June 1st and I am so excited and proud to bring you the New Release stamps for this month. Beach, Ocean, Sunflowers -- and a gorgeous girl -- along with tropical bird. What could be better? And, as with every new Monthly release, the June 2018 New release stamps are 15% off through June 8, 2018. Who doesn't love saving money? We are kicking off the month with our Design Team Blog Hop, too. Since I am the last stop, you should have gotten here from Lynda's blog, and if you did, you are just where you should be. If not, I urge you to hop on over to the TJ Design Team blog to see everything we have in store for you this month. You will NOT be disappointed! I have to say, this is my personal favorite release this year. I just couldn't wait to roll it out! I made quite a bit of artwork this month, so I am sharing 4 pieces today with more coming throughout the month. Hmmm...that background. Well, I can't tell you too much about it (that is a surprise for NEXT month), but I can tell you that I used the Messy Diamond Grid Stencil from a Colorful Life. Then I used....well, something REALLY shimmery...for the background. It will be rolling out July 1st. I am so sorry to make you wait, but I promise, it will be worth the wait! 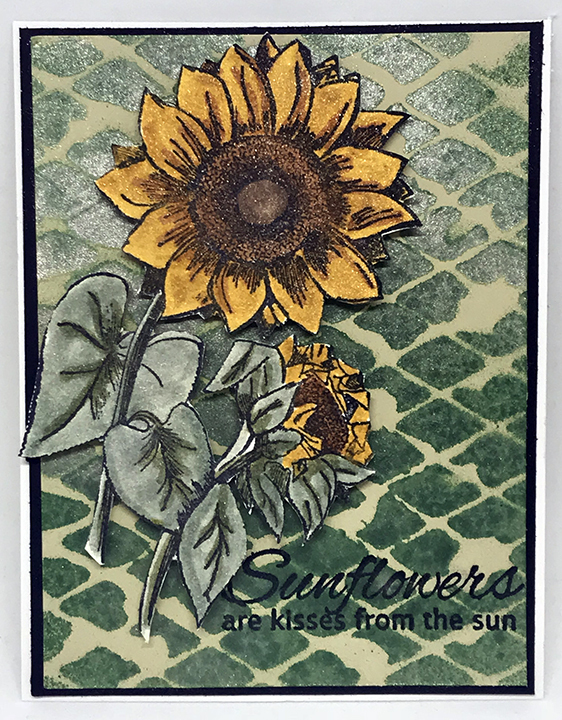 The Sunflower Duo was stamped, colored with Distress Markers and fussy cut, then popped up on the shimmering background. 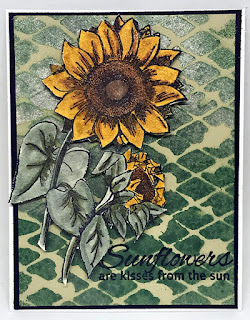 I stamped one of the two sentiments from the Sunflower Sentiments right on top of that glorious shimmer to finish the card. It is YUMMY in person! I love easy cards. Although this looks complicated, it was the easiest thing ever to make. The detail in the stamps carry this card! First I added some ink to plain white cardstock to color it. Then I stamped the Map Collage using Old Paper Distress Oxide Ink over the top. 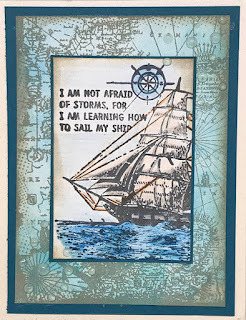 To create the focal image, I stamped the Learning to Sail image with black ink, then lightly colored it with pastel pencils. Just a little layering - and this beauty was done! This next card, featuring the That Smile! stamp, just makes me happy! I mean, don't you just LOVE her? 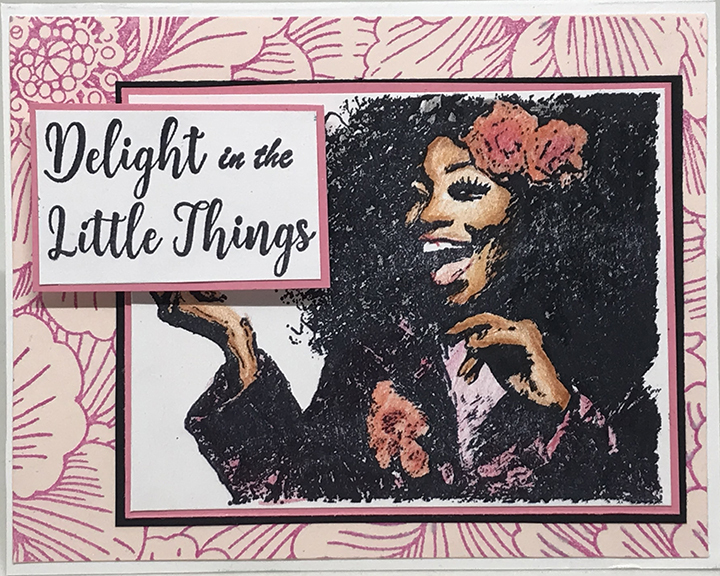 I colored the That Smile image using pastel pencils, and layered that over a background that was stamped with the Itoh Peony stamp (previously released). The sentiment is Delight (previously released), which I think is perfect for her. I hope you love her as much as I do! I love the beachy/tropical feel of this card! 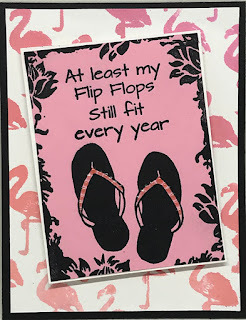 I stamped the Flip Flops Fit on pink card stock using Versafine Clair black ink (have you tried this ink? AMAZING). 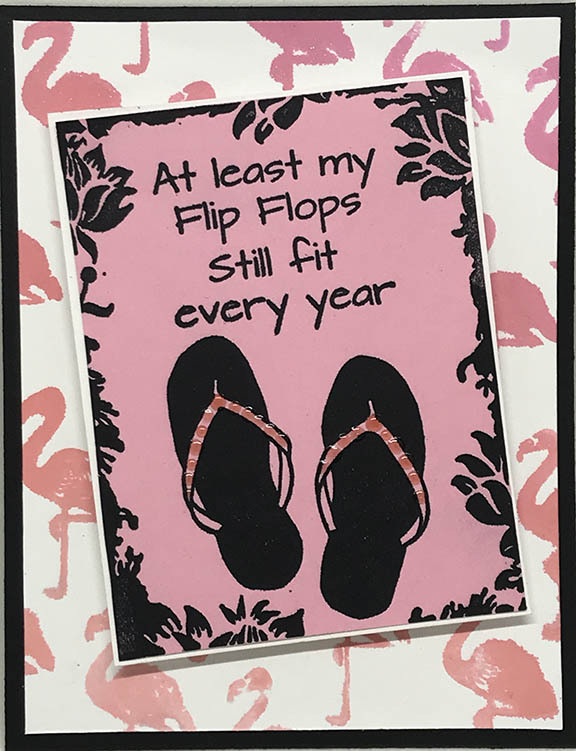 I added a few embellishments to the flip flops using Nuvo Jewel drops (sorry, I don't sell them!). 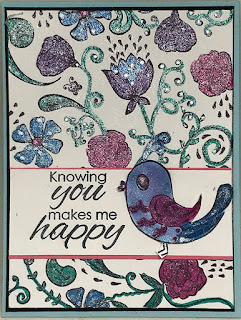 The background was made with the Flamingos Background using Direct Oxide Inks (tutorial on it's way NEXT Friday!). So beachy! Can't you just feel the sand in your toes? 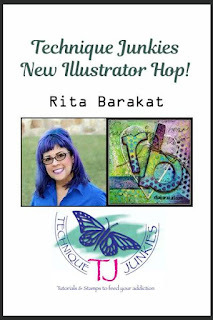 Blog Hop Celebration: New Rita Barakat Designs! I am so pleased to have a new illustrator for Technique Junkies: Rita Barakat. In celebration of the 10 new stamps being released today that Rita designed, we have a HUGE blog hop! Not only are the TJ Designers hopping, but Rita has 10 of her friends playing along, too. If this is your first stop, please take a moment and start at the beginning of the hop on the TJ Design Team Blog. The artwork all along is great, and you are sure to be inspired! 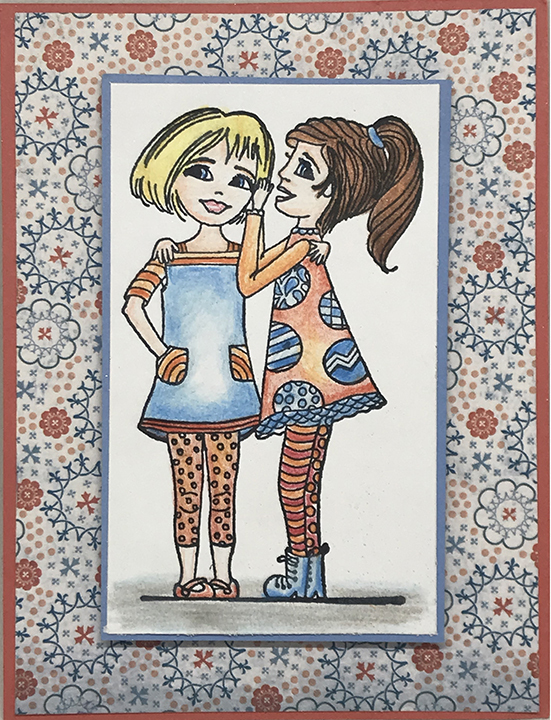 Rita has a wonderful design style and I am proud to be offering her stamps. They are so upbeat and happy! If you have gone through the hop, I think you agree with me. 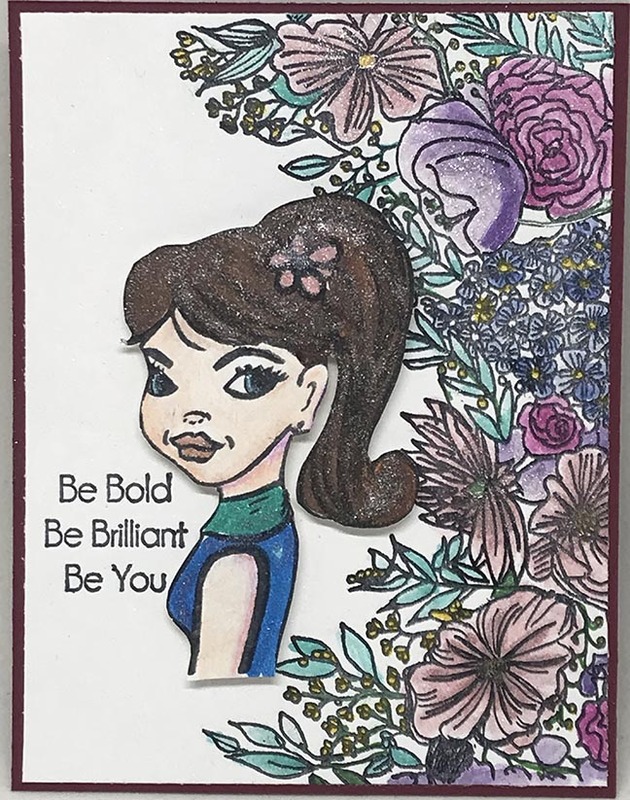 First, the card above uses the Rita Barakat Sweetie Stamp as the focal image. 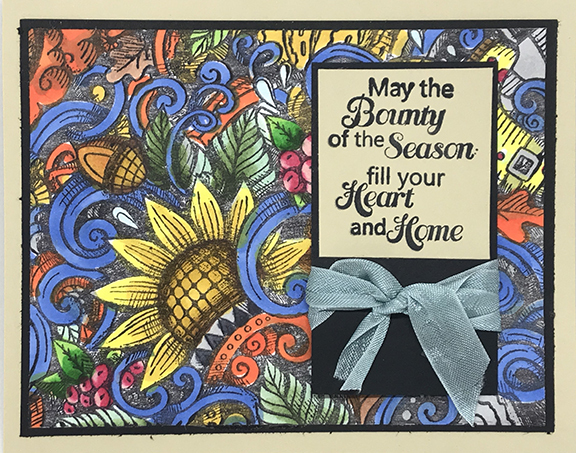 I popped the image on a panel that uses the RB Floral Border stamp, along with one of the sentiments from the Sweet Fairy Tale Set. 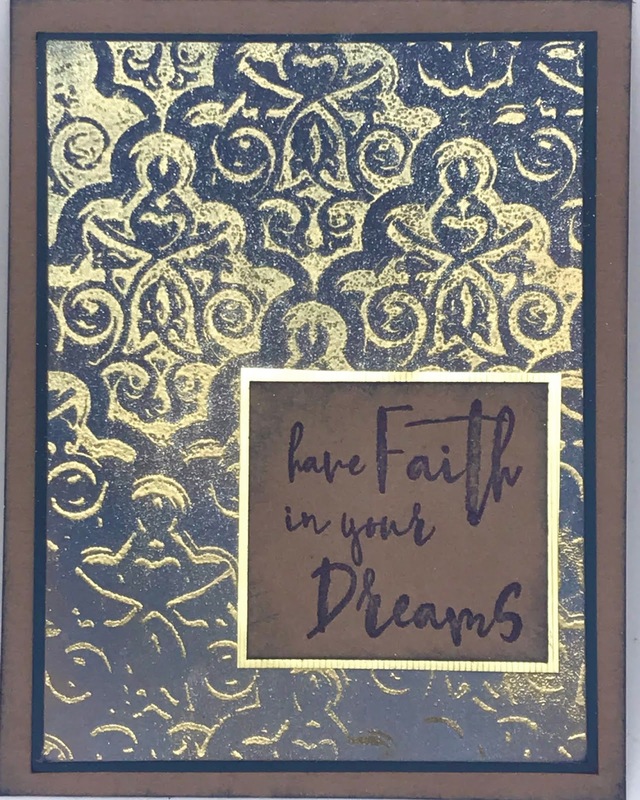 This is layered over a Love Script panel that was colored with using the Glitter Marker Resist Technique. 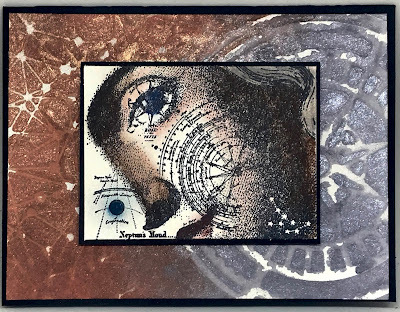 My second piece uses the Zoe Stamp as the focal image. I popped Zoe over the Floral Border. 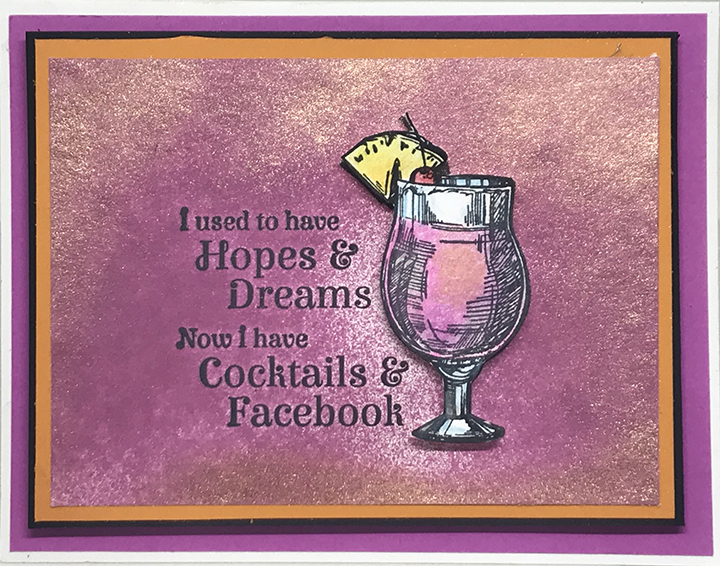 Both were colored with Nuvo Glitter Markers. The sentiment is one from the Typewriter Set. I hope you enjoyed the hop today and are inspired by all the artwork. Make sure to grab a 10% discount code from one of the TJ or RB designers to get 10% off your purchase today, too! Hope your day is as happy as these stamps are! May 2018 New Release Stamps! It is May 1st and I am proud to present our brand new stamps! 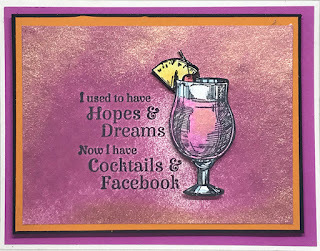 Today the Technique Junkies Design Team is having a blog hop, and I am the last stop on the hop. If you started at the TJ Design team blog, you are at the end of the hop. If this is your first stop, I recommend jumping on over to the team blog so that you don't miss any of the artwork. To celebrate the new stamps, all of the stamps in the May New Release Category are 15% off through May 8th. Just add the stamps to your cart and the discount will be applied automatically. Ready for some more inspiration? 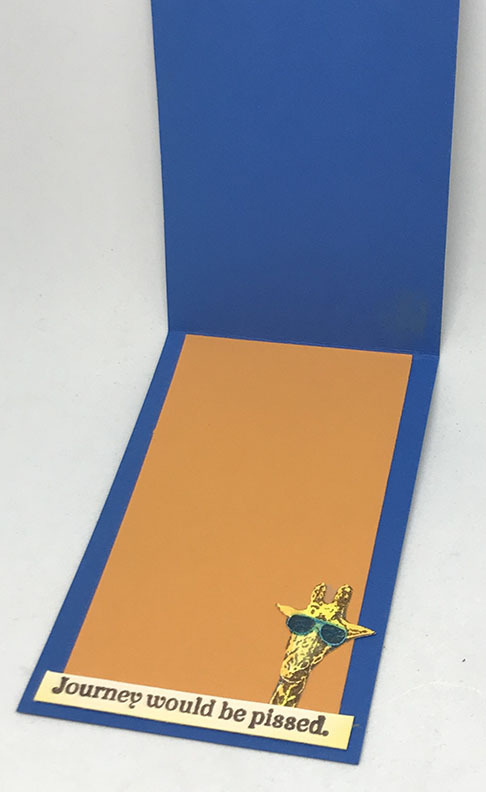 First up is this easy-peasy card. 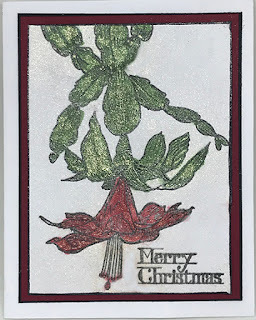 I stamped the Sketched Flowers stamp with Silver Delicata ink and matted it on a blue background. 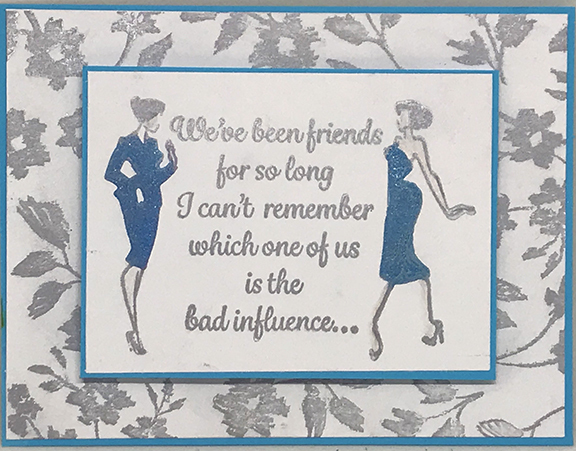 The focal image of this card uses the new Bad Influence stamp, also with Silver Delicata. The dresses were colored with Nuvo Glitter Markers to make them really stand out. It is a little hard to see in the picture, but I also added a touch of flesh tone colored pencil to the skin areas, just for fun. Next up is my BEER card! 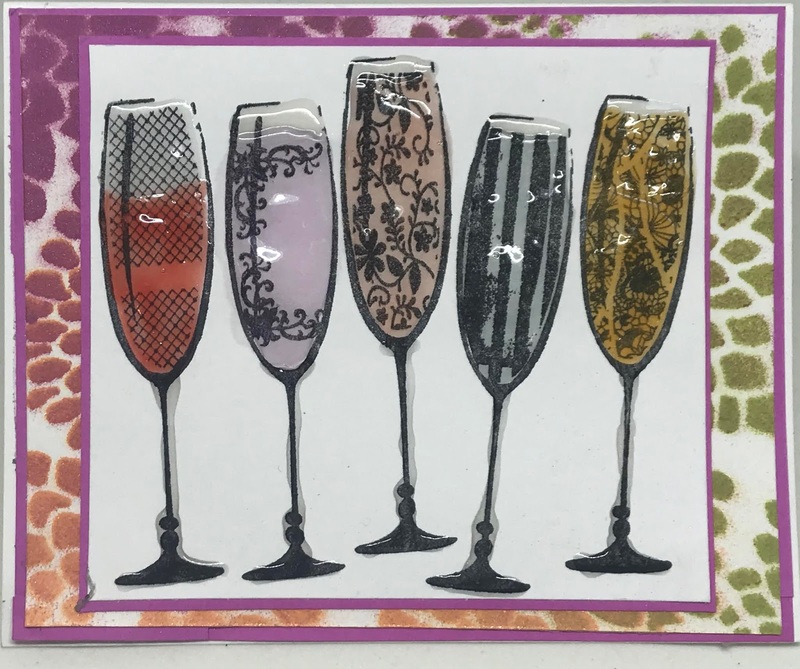 The Life and Beer image was stamped in black StazOn and colored with distress markers, then I ran the Nuvo Glitter Gloss Marker over the beer glass and suds to make them sparkle. 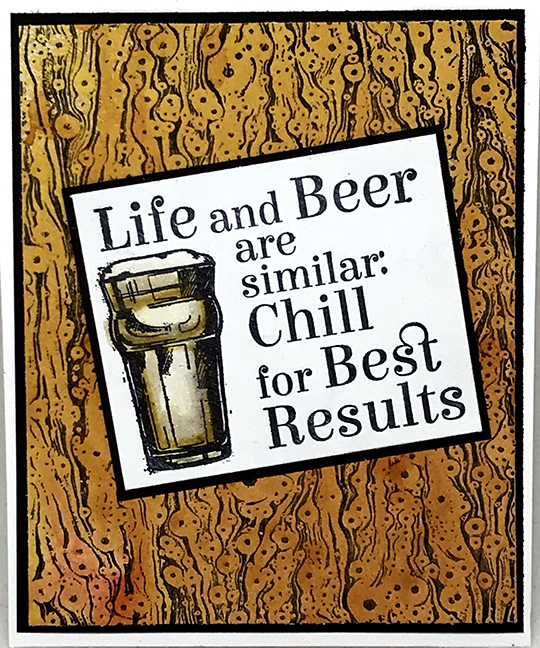 I layered this on an existing TJ stamp, which i think looks remarkably like beer suds: Tiger Marble. 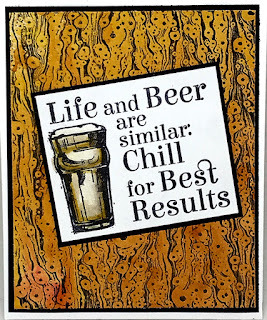 I simply stamped that and then sprayed the background with mustard and orange sprays to get beer-like image. I hope today's hop inspired you! Make sure to shop for the new release stamps before May 8th to receive 15% off the new stamps, and keep in mind that you can also get 10% off everything else in the TJ store by using one of the Design Team member's codes -- they each have one posted on their blogs. Happy May Day! 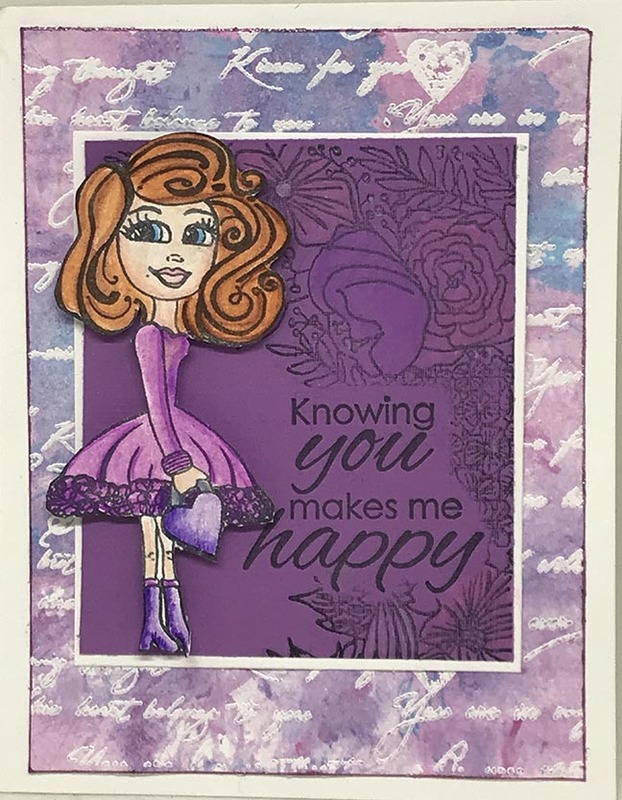 I am not a "cute" stamper, but even I love the sweetness from the Fairy Tale Flowers background combined with the Sweet Fairy Tale sentiments from my Technique Junkies line of stamps. 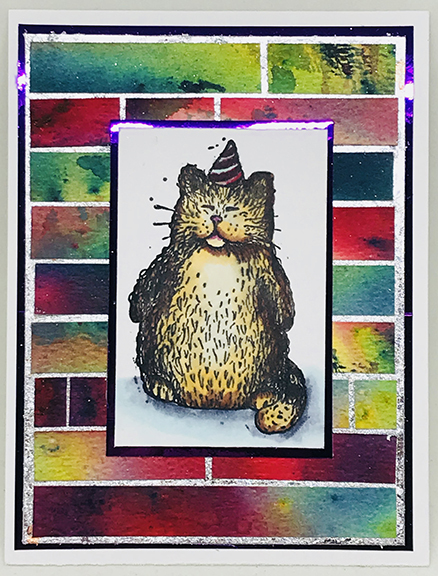 The background just SCREAMS for glitter marker coloring, and since I am a little addicted to my Nuvo Glitter Markers, this satisfies that itch a bit. You can buy them separate, or as a bundle (saves you $$), too. Second, the entire Fairy Tale sentiment set came right from my heart. The sentiment "Every once in a while, in the middle of an ordinary life, Love gives us a Fairy Tale" is especially close to my heart- it is how I feel about my husband (yes, even after 30 years of marriage! I am a sap!). In any case, I hope today's little Fairy Tale makes YOU happy. Oh, the Poppy Bouquet. I have to say, this is one of my favorites from the www.techniquejunkies.com April 2018 release. 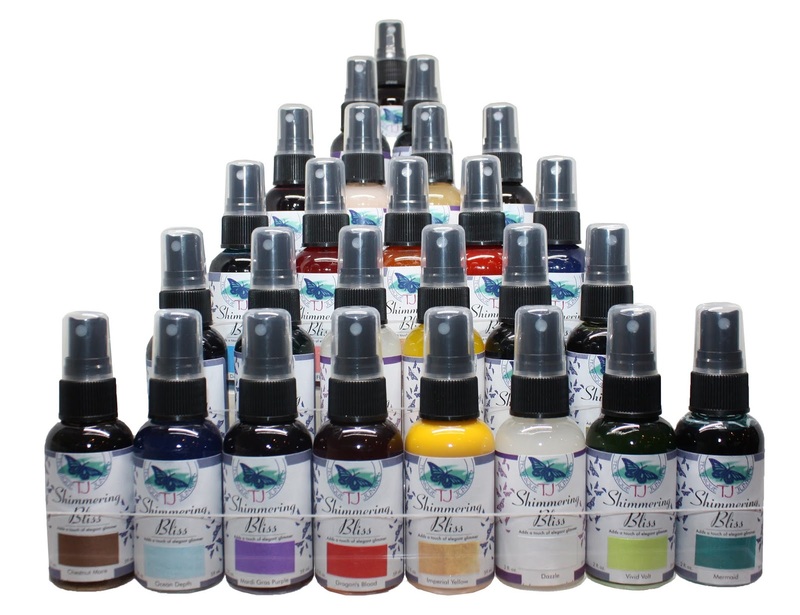 It is pretty with all of the coloring mediums I have tried on it, and very versatile. Last week several of the Technique Junkies Designers colored it as a background, so I decided to show you today what it looked like fussy-cut. 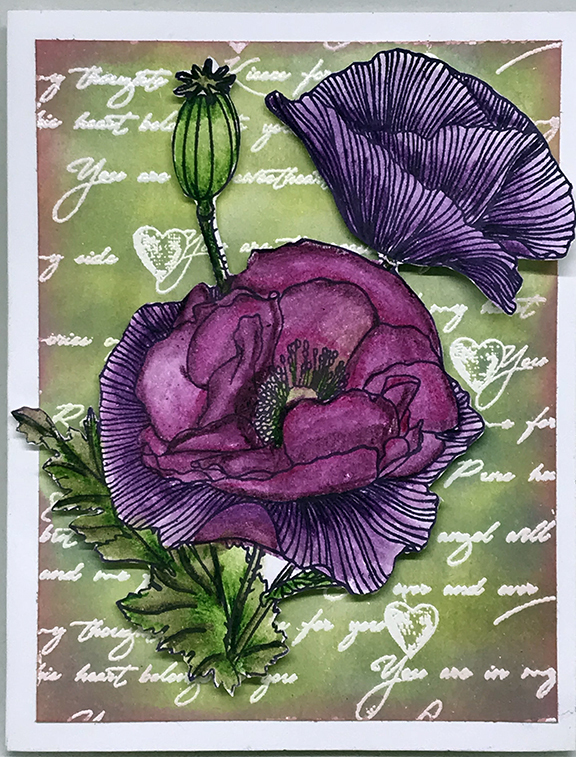 To color the Poppy, I used Derwent Inktense pencils, then I cut it out with scissors. 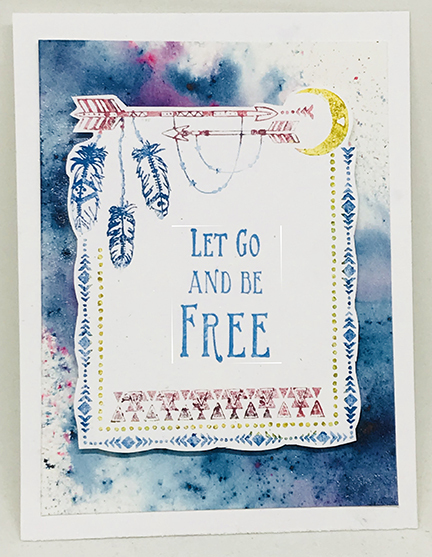 The background was created by embossing the Love Script background in white, on white paper, then colored with Distress Oxide Inks using a blending tool. 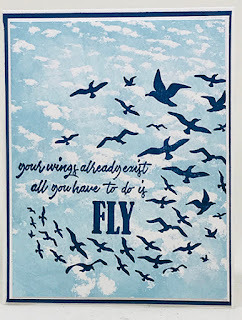 I have to say, the Emboss Resist Technique works particularly well with Distress Oxide Inks; not only do they blend well, but they wipe right off the embossed areas, leaving a crisp image behind. 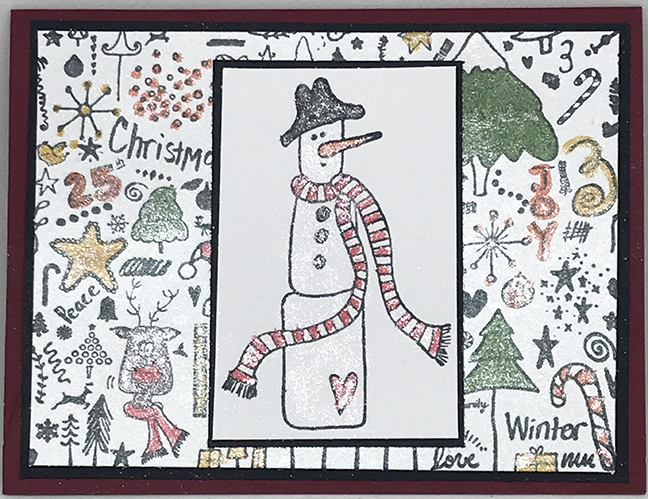 To finish, I used pop-dots to raise the image off the background and to give it dimension. I hope today fills you with inspiration! 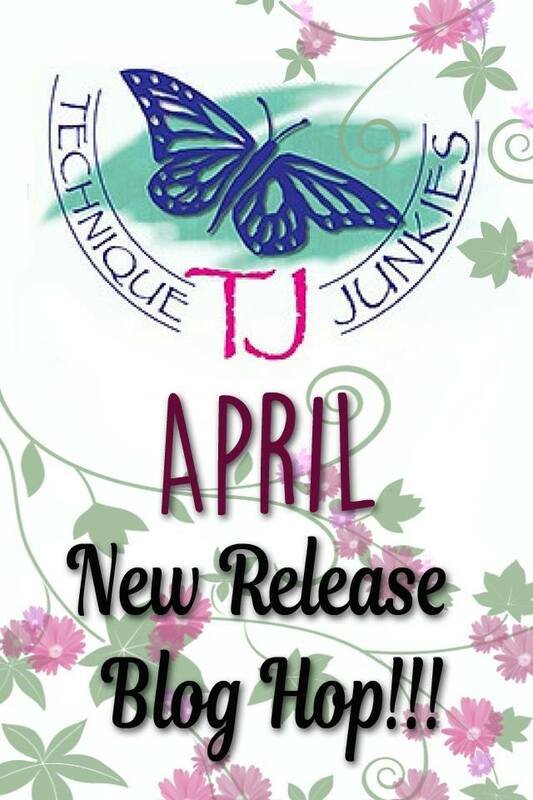 Today is April 1st and, no foolin', we have a new release! 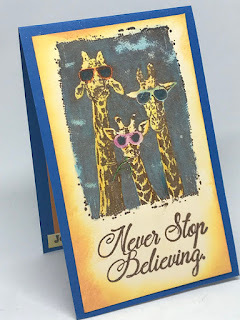 We are celebrating the release of 15 new stamps today with our monthly blog hop. If you arrived here from Lynda's blog, you are in the right place. If not, I urge you to start at the TJ Design Team blog - we have a great line up of bloggers with TONS of inspiration! All of the April 2018 Release Stamps are 15% off through April 8th, too! Just add your selection to your shopping cart, and they will be automatically discounted at checkout. 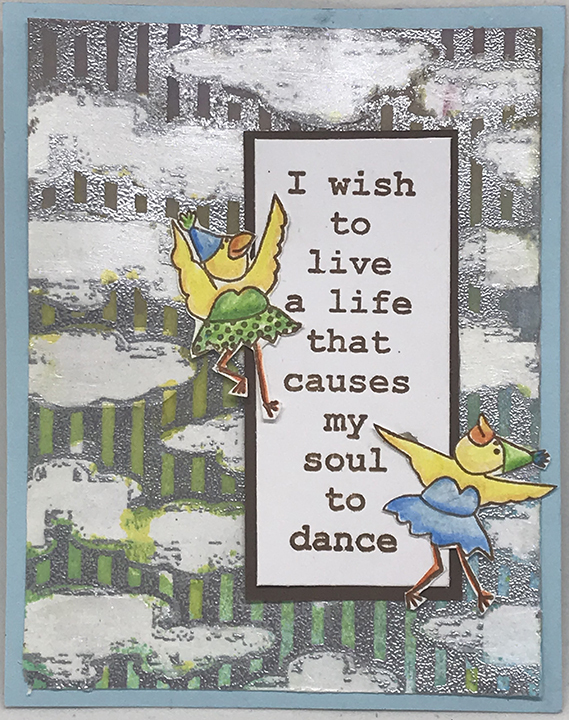 The next card is more fun - I used the Frenchified Clouds stamp with the Soul to Dance sentiment, and added some Party Chicks to lighten things up. 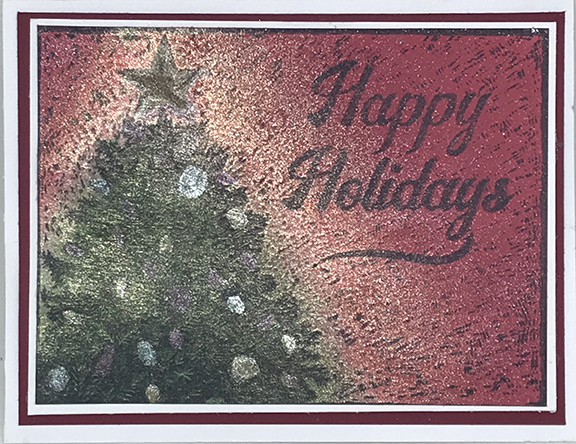 To create this, I stamped and silver-embossed the background used Art Anthology's Frost Dimensional Paint on the clouds After the paint dried, I sprayed Art Anthology Coloration Sprays over the top. 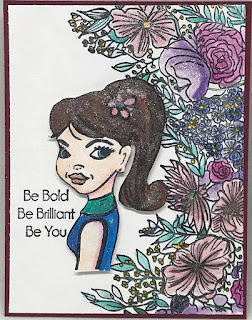 Finally, I used Niji Pearlescent Watercolors to color the Fairy Tale Flowers Background, and added a sentiment from the Sweet Fairy Tale set to top it off. 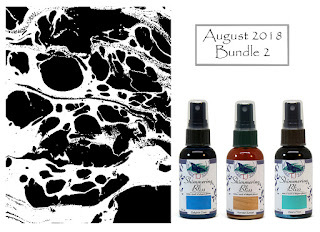 The two match perfectly -- and I you can get them as A Bundle with considerable savings, too! I hope you have enjoyed today's hop. Make sure to go take a look at all the new stamps and take advantage of the 15% discount, too! Have a Happy and Blessed Holiday. 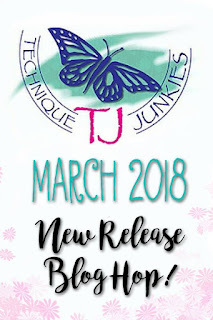 Today is March 1st - and that means that we have added new stamps to the Technique Junkies line-up! Today we are celebrating the release with a blog hop, and you have reached the last stop. If this is your FIRST stop, I suggest you start at the beginning so that you can see all of the gorgeous artwork from the Technique Junkies Design Team. Start HERE. If you came from the amazing Lynda's blog, you are in the right place! All of the new March 2018 release stamps are 15% off through March 8th, too! Just add them to your cart and they will be automatically discounted at checkout. Hopefully you picked up a TJ designer code from the hop, too, so that you can take 10% off of everything else in the store. 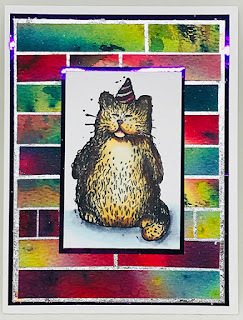 First I used the Birthday Cat stamp. 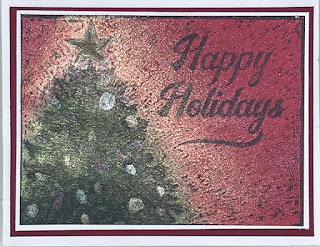 For the background, I used a piece of Color Burst-colored piece that I cut into strips, and used Gilding flakes as grout. 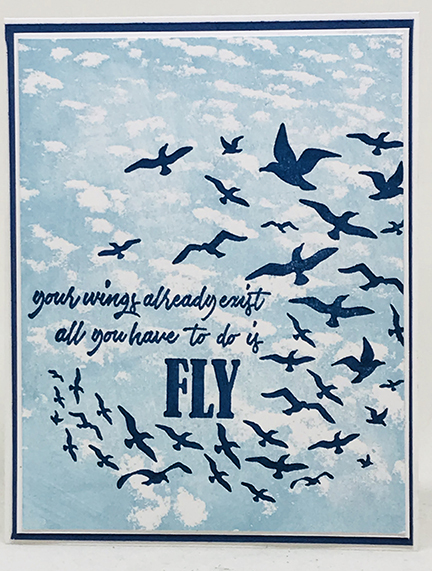 Next, I combined the Fly stamp as a focal image, with the Clouds Stamp in the background. This is probably the easiest card I made all year!. 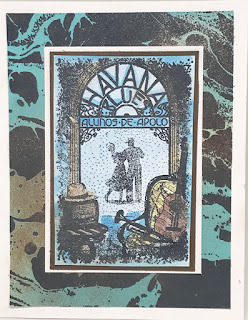 The clouds stamp is beautiful with an application of light blue ink. I used the Free Spirit set to create my dreamy frame. THis is layered over a swatch of Color Burst coloring. I used the Fresh Florals set, specifically the Prussian Blue and the Wisteria dyes. Finally, I used the Faith Family, Farming set on Kraft. 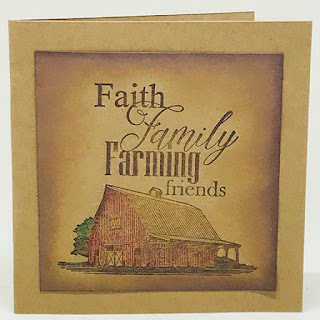 I used Distress Oxides to blend the layers of the top image, and lightly colored the barn with pastel pencils. I hope you were inspired today by the hop and all of the beautiful artwork from the design team. I also hope you found a few things to love in the new release, too! Make sure to make your selections by March 8th to receive the 15% discount on the new release stamps.